MDH Painting provides deck staining services in Lansing, East Lansing, Okemos, Williamston, Grand Ledge, DeWitt, Holt, Mason, and surrounding areas. Power washing your deck is a key step in the deck staining process. Power washing removes built-up dirt and grime that might get between deck stain and your deck. Often times, decks not properly treated before hand will see peeling within the first year. Always properly wash your deck before applying any kind of stain product. If your deck has been previously painted with house paint instead of deck stain, you may be noticing large amounts of peeling paint on the deck floor and stairs. Paint was not intended for flat surfaces which is why it’s so important to use a product like Sherwin-Williams Deckscapes which is specifically intended for decks. Stripping is only necessary in certain circumstances. Once your deck is dry, it’s time to apply the stain. Deck stain may be applied using a number of different techniques depending on the type of surface it’s being applied to and depending on whether you’re using a solid, transparent, or semi-transparent stain. Generally speaking though, deck stain is generally applied with either a brush, a roller, or a specialized deck staining broom. Decks generally require 1 – 2 coats of stain. 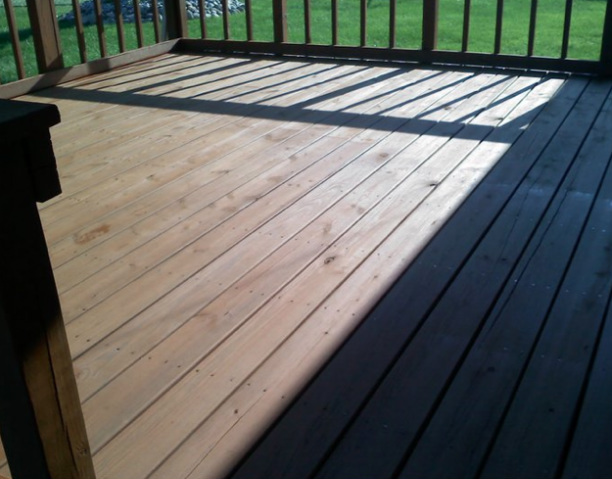 The number of coats applied depends on the state of the deck prior to staining. Generally, we will apply two coats of stain to horizontal surfaces like the deck floor, the stairs, and the tops of rails. Vertical surfaces like spindles and fascia along the outside of the deck only require 1 coat unless you are changing the color. We offer a number of other services, including: exterior painting, interior painting, power washing, floor coatings, and holiday lighting.